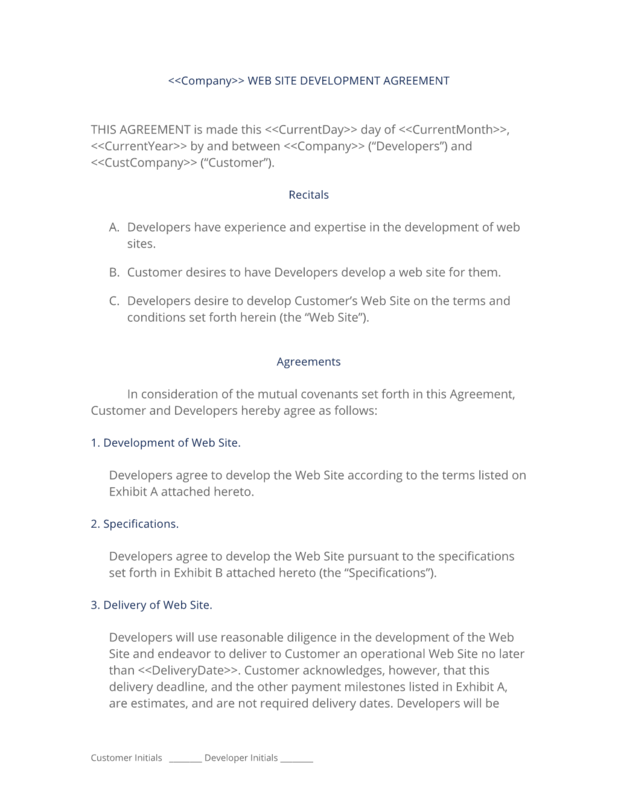 This is a variation of the standard Web Site Development Contract. Edit as needed to create your starting contract for your business. Each client may require modifications to the standard contract which you will need to deal with on a per-project basis. This version was created by common request from many developers wanting a comprehensive contract, without the clauses their clients found objectionable (typically regarding copyright ownership). The client-centered version gives the client basically rights to everything done (except to your preexisting material). Normally we do not recommend this, as it will prevent the developer from leveraging work created on a project for future use in other projects. It is only included by common request from our users. It is your responsibility to understand the implications of giving up your rights to work created for a client which, by default, would normally be retained by the developer. We recommend that you compare this variation with the standard version above and consult your own attorney if you have questions. Contract Pack offers me exactly what I need. From contracts to model releases the kit offers everything I need to make it through my day to day jobs." This Web Development Contract (Client Centered) is included in editable Word format that can be customized in Word or by using the included Wizard software. THIS AGREEMENT is made this Current Day day of Current Month, Current Year by and between Company Name ("Developers") and Company Name ("Customer"). Developers have experience and expertise in the development of web sites. Customer desires to have Developers develop a web site for them. Developers desire to develop Customer's Web Site on the terms and conditions set forth herein (the "Web Site"). The output is to be used only within the scope of the project as outlined in Exhibit B and does not included the following: Multiplying the site across other domains or servers, creating new web sites based on the code or selling or distributing the code to a third-party. Customer shall retain all of its intellectual property rights in any text, images or other components it owns and transmits to Developers for use in the Web Site. Customer shall retain all of its intellectual property rights in any text, images or other components it owns and transmits to Developers for use in the Web Site. Customer shall hold the copyright for the agreed upon version of the Web Site as delivered, and Customer's copyright notice may be displayed in the final version. Developer retains exclusive rights to pre-existing material they use in Customer's project(s). Customer does not have right to reuse, resell or otherwise transfer material owned by Developer or third-parties. Developer's materials shall be defined as set forth in Exhibit C, attached. Developers are retained as independent contractors. Developers will be fully responsible for payment of their own income taxes on all compensation earned under this Agreement. Customer will not withhold or pay any income tax, social security tax, or any other payroll taxes on Developers' behalf. Developers understand that they will not be entitled to any fringe benefits that Customer provides for its employees generally or to any statutory employment benefits, including without limitation worker's compensation or unemployment insurance. In the event Developers are unable to continue maintenance of the Web Site Customer shall have non-exclusive rights to use pre-existing material (see Exhibit C) owned by Developer in connection with Customer's Web Site. The complete Web Development Contract (Client Centered) - with the actual formatting and layout - is available in this Contract Pack.